Follow in the footsteps of Hogwarts' most intelligent student, Hermione Granger, and use this this beautiful Harry Potter Hermione Granger Notebook and Wand Pen Set. Whether you're taking notes in class, planning your next adventure, or writing your own story of magic and heroism, this set is perfect for you. 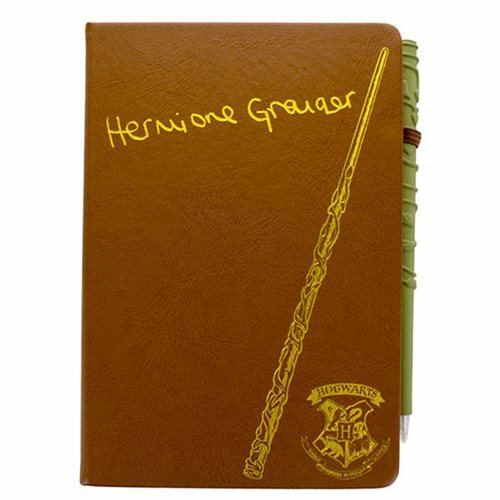 The set contains Hermione Granger's notebook with her name written on the front. The notebook is perfectly bound, has 200 lined pages, and has the Hogwarts crest on the inside cover. The set also comes with a pen in the design of Hermione's wand from the Harry Potter movies!